my days were filled with skateboarding and baseball cards. Music wasn’t on my radar until high school when I began running sound and playing guitar in the band at my church. I immediately fell in love with music and the gear that’s used to make it. I could often be found drooling over instrument catalogs in my free time. So, how does a musician in the “real world” feed his unquenchable gear addiction? Turn it into a business! That is what inspired me to start selling great gear…I simply love being around it. Every single piece I sell is a musical treasure to me in the short time it’s in my shop. I’ve owned Nashville Gear Factory since 2004 while being a professional touring musician here in TN and understand your love for great music gear. It’s the same passion I’ve had most of my life. 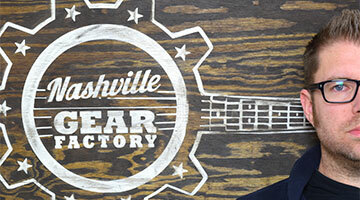 What makes Nashville Gear Factory different? Besides selling some of the coolest gear collection on the planet, it’s the personal service. When you email, you get me. When you call, you get me. I’m picking the instruments, describing them, and packing them to ship out to you. Feel free to contact me with any questions. I’d love to get your next musical treasure in your hands.